Noida-based Solvy Tech Solutions Pvt Ltd, which runs hyperlocal mobile marketplace Zopper, has acquired EasyPOS, a cloud-based point of sale software maker in a cash-and-stock deal. The EasyPOS employees will merge with the Zopper workforce and the founders will form part of Zopper’s senior management team, Lalit Singh, co-founder of EasyPOS told VCCircle. The valuation of EasyPOS was not revealed. “By deploying the EasyPOS solution at the retailers’ outlet, we will empower them to make smarter decisions on inventory management, demand estimation, local area consumer marketing, analytics, trends, etc., in addition to making listing, selling and tracking on the Zopper platform easier,” said Harneet Singh, chief business officer of Zopper. Founded in 2014 by former EY employees Lalit Singh and Pawan Karki, Delhi NCR-based EasyPOS, operated by Upsilon Consulting Pvt Ltd, is a SaaS (software as a service) based end to end retail ERP (enterprise resource planning) platform developed for small and medium sized businesses. The platform helps manage the entire business needs through a host of features that include billing, CRM (customer resource management), inventory management, employee management, vendor management and expense management among others. A dashboard provides a comprehensive analytics platform. “By marrying the benefits of offline and online channels of shopping, the company brings to its users both the convenience of online shopping and the trust associated with buying electronics from local neighbourhood retailers,” said Singh. 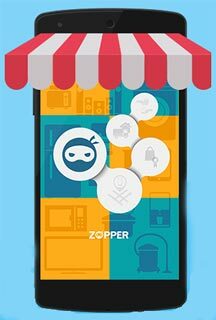 Founded in 2011 by Surjendu Kulia and Neeraj Jain, Zopper is now a mobile-app only startup that lets its users explore a range of products under various categories including computers and accessories, mobile phones, home appliances, apparels and accessories, baby products and kitchen ware in local offline stores. It was earlier called Reviews24, but rebranded itself as Zopper last year. Currently, Zopper claims to have more than 15,000 retailers on its platform. In June last year, the company raised $20 million (around Rs 127 crore) in its second round of funding from existing investors Tiger Global Management and Nirvana Venture Advisors. In July 2014, Zopper had raised $5 million in an institutional round of funding led by Tiger Global with participation from Nirvana Venture Advisors and Blume Ventures. The company has raised over $27 million till date.